Anxious to replace their recently departed cowboy star Ken Maynard, Columbia planted Allen into Maynard’s boots-and his familiar costume. 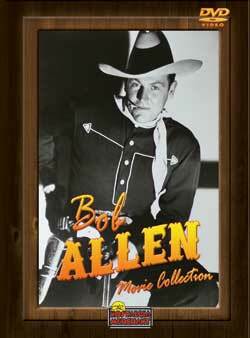 Allen starred in six B westerns in 1936 and 37, all of which had the word ‘Ranger’ in the title. However, the studio was looking for a singing cowboy to compete with Gene Autry and Allen was eventually replaced by Roy Rogers. This collection includes 6 full-length features. MOVIE TITLES: The Unknown Ranger (1936), Rio Grande Ranger (1937), Reckless Ranger (1937), Law of the Ranger (1937), The Rangers Step In (1937), Ranger Courage (1937).